While visiting the town of Gimli in Manitoba, Canada, visitors can follow the sign at the Main Dock boat harbour and view the collection of Lake Winnipeg wall murals. All the way along the waterfront walkway, beautiful wall murals have been erected and it often takes one several hours to walk while enjoying the murals, the scenery and the serenity of this town. Fresh water fishing is one of the main industries in the town of Gimli, a town which was settled by Icelanders in the last half of the 19th century. Having the largest population of Iceland ancestry, a museum has been built to explain the heritage and the tales of the first settlers. Situated about 75 kilometers north of Winnipeg, Manitoba, this little town has a population of about 6,000 and about 30,000 people come here during the Icelandic Festival. Summer is the best time to visit this town where cottages line Lake Winnipeg and hotels and restaurants are plentiful for tourists. Sandy beaches and a relaxing environment make the town of Gimli the ideal place to enjoy a summer vacation. 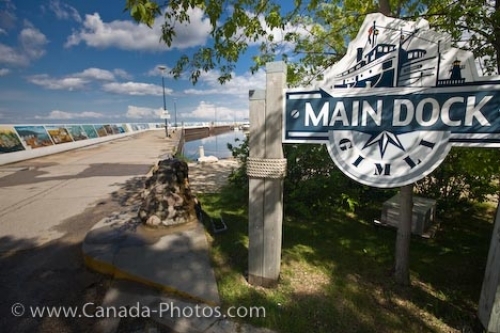 Picture of the sign at the Main Dock boat harbour in the town of Gimli along the shores of Lake Winnipeg in Manitoba, Canada. Sign at the Main Dock boat harbour and a collection of Lake Winnipeg Wall Murals in the town of Gimli, Manitoba, Canada.